Mark Wilson has put up some vids on YouTube with performance clips and interest items about his experiences starting the Blowing Rock Stage Company, and being the A.D. there for quite a while. I enjoyed working at BRSC many times during the l990's. I did Oil City Symphony, Stardust, Raney, Radio Gals, and Foxfire there. I've been working with Clyde Edgerton on a musicalized reading of his latest novel THE BIBLE SALESMAN. 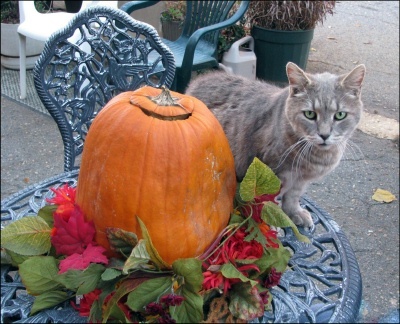 We had several informal readings in December in Wrightsville Beach, and we also recorded it there. I'm currently editing and mixing that recording and am hoping for a spring release. Clyde plays mandolin, and I play piano and guitar. We have written some songs for the show and do a selection of traditional tunes too. Clyde has always been interested in combining music with his writing and was indeed a musician before he was a novelist. He plays the banjo and also played keyboards in bands to help support himself when he was in college. Here's a photo of Clyde, with Robert Earl Keen, at a benefit for the writer Larry Brown. He's just drinkin' a beer, but he usually does a lot more than that! We'll be doing performances of THE BIBLE SALESMAN on Feb. 26, in Wilmington at UNC-W, and April 9th, in Raleigh, at NCSU, and again on April 23rd in Frederick, MD. FMI: -- and also THE BIBLE SALESMAN, which is under construction, but more info coming soon. John Miller profile in the WALL STREET JOURNAL. John is a music contracter and bass player. I knew him and worked with him when we were doing OIL CITY SYMPHONY in New York. Triona Ni Dhomhnaill writes that a tribute CD to her brother Micheal O'Domhnaill has recently been released. The CD is called "Keep 'Er Lit -- the Songs and Music of Micheal O'Domhnaill". The tribute CD features 15 tracks and a 40 page booklet of lyrics, background info, reminiscences and photographs. It also features a previously unreleased recording of 'Lord Franklin' by The Bothy Band. New CDs everywhere! And that's GOOD!! 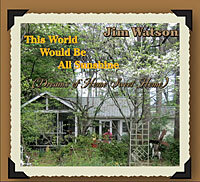 Jim Watson has a new CD out, just in time for his Christmas shows. 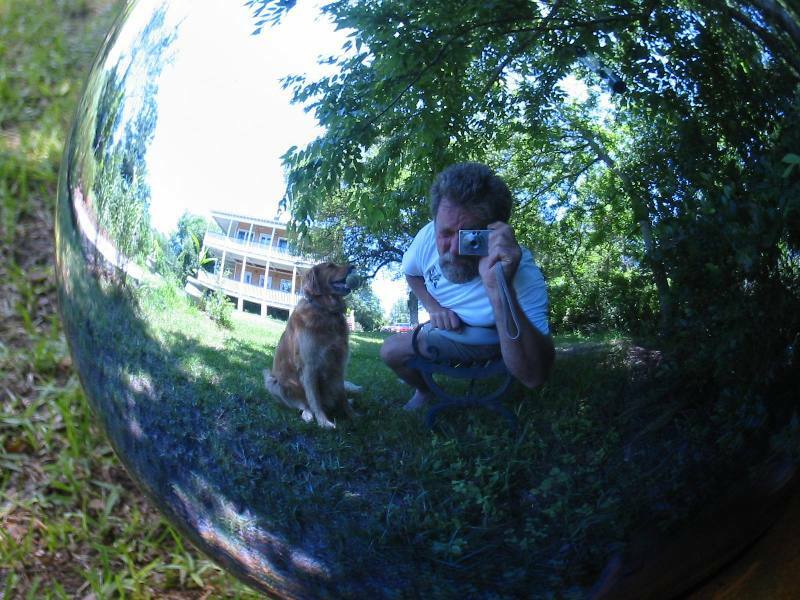 Jim is calling the album THIS WORLD WOULD BE A PLACE OF SUNSHINE, and it has a cool cover photo of him at same. The songlist is: If I Only Had a Home, Somewhere Down Below the Dixon Line, Sweet Sunny South, The Death of Ellenton, Have I Stayed Away Too Long, Calling the Prodigal Son, A Distant Land to Roam, Write a Letter to My Mother, Daddy and Home, Mother's Last Farewell Kiss, Where the Whippoorwill Is Whispering Goodnight, A Vision of Mother, Prairie Lullaby, Uncloudy Day, If I Only Had a Home. Funny and clever video clip about Proposition 8 featuring John C. Reilly, Craig Robsinson, Rashida Jones, Kathy Najimy, Maya Rudolph, Allison Janney, Marc Shaiman, Margaret Cho, Neil Patrick Harris, and Jack Black (as Jesus) -- all in great voice! The Cook Shack, Union Grove, NC. The above drawing was made by my financial adviser on a visit I made to him last week to consult on the state of my 'portfolio'. He was trying to explain the recent markets to me. No wonder we don't have a lot of confidence in the financial sectors. "Behind everyone alive today stand 30 ghosts -- for that is the ratio by which the dead outnumber the living. Since the dawning of time about 100 billion human beings have walked on this planet. Now, 100 billion is about the number of stars in our Milky Way galaxy. So this means that for everyone who has ever lived, there could be a star. Of course stars are suns with planets circling around them, -- so isn't it an interesting thought that there's enough land in the sky for everyone to have a whole world? We don't know how many of those worlds are inhabitied, and by what kind of creatures, but one day we shall know, perhaps by radio, perhaps by other means, perhaps by direct contact. The impact of that upon the human race will be profound, especially if we encounter creatures far in advance of our own rather primitive species. Well, it's a wonderful thing to look forward to -- and perhaps a terrifying one. It may happen in our lifetimes. It may happen in a thousand years. But one day we will know the truth about this wonderful and incredible universe around us and perhaps understand our own place in it." When they called the election for Obama at 11 PM Nov. 4th, the ABC cameras panned out and you could see the faces on the crowds of people all over the country, from Times Square to Grant Park and everyplace in between... so freakin' happy! One of the most beautiful things I'd ever seen. It was like the Wicked Witch was dead. I've been welling up with sheer joy and gratitude ever since. By-line in the next morning's WASHINGTON POST: "Win suggests the country might be in a gravitational pull toward a rebirth."